Cam McDaniel celebrates a touchdown against Michigan State. If you like close, defensive battles you had to absolutely love this game. This is what they used to call a slobber knocker. Both teams feature defenses that will flat out bring the wood. In the Spartans first two games, the defense had outscored the offense 24-12. 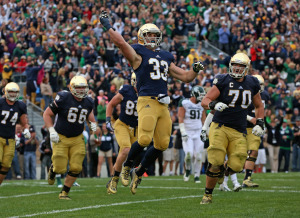 Although the Irish defense had given up more points than last year, they are always a unit that isn’t shy to hit you. Michigan State got the first break of the game. The Irish went 3 and out on their first possession, then Spartan receiver Matt Macksood blocked the Notre Dame punt, giving Michigan State the ball at the Irish 31 yard line. After gaining one first down, the drive stalled, but Spartan kicker Kevin Muma missed a 30 yard field goal and the Irish dodged a major bullet. On their next series, the Irish drove to the MSU 29 yard line, but the Spartans held and on 4th and 3, the Irish elected to go for the first down. Irish QB Tommy Rees attempted to hit sophomore receiver DaVaris Daniels, but the pass was incomplete and the Spartans held. The Irish defense held Michigan State and on Notre Dame’s next possession, they were able to get on the scoreboard. The Irish went on a 7 play 57 yard drive and cashed in on a 41 yard field goal to take a 3-0 lead. The Spartans finally got on the scoreboard in the 2nd quarter. They went on a very impressive 14 play 79 yard drive that took 5:46 off the clock. Nick Hill and the Spartan running game finally got some momentum, moving the ball to the Notre Dame 12 yard line. From there sophomore QB Connor Cook connected with sophomore receiver Macgarrett Kings Jr. for the TD and the 7-3 lead. With 3:00 left in the half, Notre Dame QB Tommy Rees led the team on a touchdown drive. Rees hit TJ Jones from 2 yards out to take a 10-3 lead with only 0:17 left and Notre Dame had a 10-7 lead at the half. The Spartans answered with their first possession of the 3rd quarter. Once again, they put together a long 15 play, 75 yard drive that took 8:39 off the clock. Connor Cook mixed runs by junior running back Jeremy Langford with the short passing game. The drive finally stalled at the Irish 8 yard line and Geiger kicked a 25 yard field goal to tie the score at 10-10. The Spartans held Notre Dame, forcing a punt and got the ball at their own 29 yard line. Four plays later, they tried a halfback pass that was intercepted by Irish safety Matthias Farley, who returned it to the Michigan State 37 yard line. Notre Dame capitalized on the good field position 5 plays later on a 7 yard touchdown run by junior running back Cam McDaniel. With 14:44 left in the game, the Irish were on top 17-10. Michigan State continued to move the chains and went on a 10 play drive that resulted in a 42 yard field goal, to cut the Notre Dame lead to 17-13 with 10:40 left. That field goal was the last scoring play of the game with neither team able to generate a drive. The game ended with the Irish earning a hard fought 17-13 win. The Irish really needed this win. They had lost a 41-30 game two weeks ago against Michigan. The win puts them at 3-1 going into a tough home game against Oklahoma. They have to be concerned with their defense’s inability to get off the field on first down. The Spartans had two drives of more than 14 plays. The loss was the first of the year for the Spartans. This week they travel to Iowa to face the Hawkeyes in a battle of two 3-1 teams. Tommy Rees, QB, Sr: Started in 2011, but was beaten out in 2012 by Everett Golson. Reinstated as the starter after Golson’s academic suspension. Pocket passer that lacks elite athleticism. Tough. Willing to stand in the pocket and take shots. Decent arm with average accuracy. Reads defense well and finds his second and third receiver. Sometimes tries for the big play when he could have checked down to a sure completion. Completed 14 of 34 for 142 yards and 1 TD. George Atkinson III, RB, Jr: NFL bloodlines, son of former Raiders safety George Atkinson Jr. Good speed and vision. Great return man, with two kickoff return touchdowns in 2011. First year as the starting running back. Does a good job finding creases. 6 carries for 23 yards. 2 receptions for 17 yards. Cam McDaniel, RB, Jr: Led the team with 40 rushing yards on 16 carries and had 1 rushing TD. Tough, playing with a cast on his arm. Physical, downhill running style. Determined runner that moves the pile. Received stitches after having his helmet knocked off, but returned. The team’s closer that they trust in the 4:00 drill when they are trying to kill the clock. TJ Jones, WR, Sr: Led the team in receptions in 2012 and is their leading receiver this year. Good vertical jump. Great body control. Able to return punts and plays on punt coverage teams. 2 receptions for 15 yards and 1 TD. Fumbled a punt. Troy Niklas, TE, Jr: Former outside linebacker. Big size, 6’6” and 270 pounds. Has good hands. Takes over the main tight end chores after the graduation of Tyler Eifert. So far not a big contributor in the passing game, but you can see the potential. 1 reception for 7 yards. Zack Martin, OT, Sr: Four year starter. Does a good job protecting the quarterback’s blind side. A very good run blocker. Stephon Tuitt, DE, Jr: Good pass rush ability. Led the team with 11 sacks in 2012 and has 2 sacks this year. Prototypical 3-4 defensive end. Had off-season surgery for a sports hernia and still seems to be recovering. Very strong. Has long arms that keep blockers off of his body. 6 tackles, 1 tackle for loss, 1 sack and 1 QB hurry. Louis Nix III, NT, Jr: Big, massive 3-4 nose tackle. Surprising athleticism and ability to pursue down the line of scrimmage. Very strong. Demands a double team and has the ability to beat it. 6 tackles and 1 batted pass. Had a face mask penalty. Prince Shembo, OLB, Sr: Natural pass rusher. Able to play standing up or in a 3 point stance. Gives relentless pursuit. The Irish like to put him in situations to take advantage of his pass rush ability. 1 tackle, 1 QB hurry. Carlo Calabrese, ILB, Sr: Versatile. Good run defender. Also able to help out in pass coverage. Has played inside and outside linebacker. 8 tackles, 1 tackle for loss. Bennett Jackson, CB, Sr: Good size. Uses his long arms to jam receivers. Good in man coverage. 7 tackles. Matthias Farley, S, Jr: Tracks the ball well. 2 tackles and 1 interception that he returned 29 yards. Andrew Maxwell, QB, Sr: Was the starter in 2012, but lost his job to sophomore Connor Cook. Did not have a good 2012, but his receivers dropped a lot of balls. Was forced into the game with 3:00 left after Cook was injured. Did not look comfortable. Jeremy Langford, RB, Jr: Powerful. Good leg drive. Likes to pound at the defense. Able to run the wildcat. Led the team with 14 carries for 68 yards. Had 1 catch for 12 yards. Nick Hill, RB, Jr: Has good feet and good leg drive. Good hustle. Small, but has good lower body strength. 13 carries for 34 yards. Had a dropped pass. Made a bad decision returning a kickoff and was tackled at the 9 yard line. Dan France, G, Sr: Pulls well. Stays parallel to the line of scrimmage. Marcus Rush, DE, Jr: Big and tough. Blue collar. 3 tackles. Tyler Hoover, DT, Jr: Pushes pocket well. Pursues downfield. 5 tackles. Max Bullough, ILB, Sr: Third generation Spartan football player. Experienced. Able to take on blockers and still make the play. Always around the ball. 7 tackles, ½ tackle for loss. Jairus Jones, LB, Jr: Athletic. Former safety. Good in pass coverage. Does a good job reading the QB’s eyes and reacting to the ball in the air. 1 tackle and 1 pass breakup. Darqueze Dennard, CB, Sr: Physical corner that likes to press. Able to cover slot receivers. Closes quickly on the ball. Good tackler in space. Times hits well. 2 tackles, 1 tackle for loss, 1 pass defended and 1 QB hurry. Had a pass interference penalty. Kurtis Drummond, FS, Jr: Leading the team in tackles. Big play guy. 7 tackles, 2 tackles for loss. This entry was posted on September 26, 2013 by draftmaniacs in Scouting reports and tagged 2014 NFL draft, Fighting Irish football, Michigan State football, NFL Draft, Notre Dame football, Spartan football.